is out for you ! Welcome to the Ocular Surface Center Berlin (OSCB) ! The OSCB is a non-profit Science Institute for the advancement of knowledge* on the ocular surface. This concerns the normal structure and function, the interaction with contact lenses, as well as the alterations that lead to the onset and potential progression of ocular surface disease, such as e.g. Dry Eye Disease, Meibomian Gland Dysfunction (MGD), Blepharitis, Ocular Allergy. * Disclaimer: Even though this site is based on scientific results and experience in a medical field and information is carefully checked - the information here is not for medial advice, cannot replace the visit at a clinical practice and cannot be used for prescriptions or therapy. 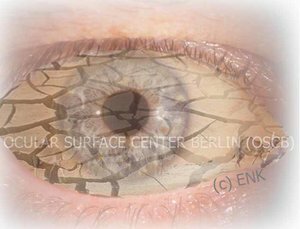 On these pages of the Ocular Surface Center Berlin (OSCB) you will find relevant research based information on many aspects of the Ocular Surface. All aspects are covered over the full range. From the Anatomical Structure over the Physiological Function and Regulation to Dysfunction, Disease & Clinics including Therapy Options *. The enormous amount of new data in research and clinics on Ocular Surface and Dry Eye Disease, appears to make the understanding more and more multifaceted and complicated. Therefore we have thought about a new vision of the Ocular Surface and of Dry Eye Disease. A completely new way to SEE and VIEW the Ocular Surface. All information is joined by original artwork in a DYNAMIC pictographic self-explanatory style. When the content of STATIC images becomes to complex ... they are transformed into ANIMATED Images. Static slides are mixed with ANIMATIONS that make everything intuitively understandable. This is a HOLISTIC way that allows to see the full picture at first glance, like a landscape from above.